In the sweeping, poignant sequel to The Vintner's Daughter, the Lemieux family's ambition to establish an American winemaking dynasty takes Sara and Philippe from pastoral Napa to the Paris World's Fair and into the colorful heart of early 20th-century San Francisco. It is 1897, and Sara and Philippe Lemieux, newly married and full of hope for the future, are determined to make Eagle's Run, their Napa vineyard, into a world-renowned winemaking operation. But the swift arrival of the 20th century brings a host of obstacles they never dreamed of: price wars and the twin threats of phylloxera and Prohibition endanger the success of their business, and the fiercely independent Sara is reluctant to leave the fields behind for the new and strange role of wife and mother. An invitation to the World's Fair in 1900 comes just in time to revive the vineyard's prospects, and amid the jewel-colored wonders of Belle Epoque Paris, Sara and Philippe's passion is rekindled as well. But then family tragedy strikes, and, upon their return to California, a secret from Philippe's past threatens to derail their hard-won happiness in one stroke. Sara gains an ally when Marie Chevreau, her dear friend, arrives in San Francisco as the first female surgery student to be admitted to prestigious Cooper Medical College. Through Marie, Sara gets a glimpse of the glittering world of San Francisco's high society, and she also forges friendships with local women's rights advocates, inciting new tensions in her marriage. Philippe issues Sara an ultimatum: will she abandon the struggle for freedom to protect her family's winemaking business, or will she ignore Philippe and campaign for a woman's right to vote and earn a fair wage? Fate has other plans in store in the spring of 1906, which brings with it a challenge unlike any other that the Lemieux family or their fellow Northern Californians have ever faced. Will the shadow of history overwhelm Sara and Philippe's future, despite their love for each other? 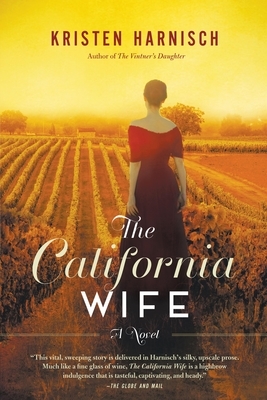 In The California Wife, Kristen Harnisch delivers a rich, romantic tale of wine, love, new beginnings, and a family's determination to fight for what really matters sure to captivate fans of The Vintner's Daughter and new readers alike. What is Sara’s overarching challenge in The California Wife? What does she learn from her trials and how does she change? Sara Lemieux and Marie Thibault have both endured prejudice and attacks because they are women in a man’s world. How would you compare the treatment of American women today versus then? Are we better off, or do we just face different kinds of discrimination and/or objectification? Why do you think the author chose to weave into the plot the storyline of Marie Chevreau and Matthew Donnelly? How is their relationship similar or different to Sara & Philippe’s? How does the author use the various settings—Saint Martin in Vouvray, the Paris Exposition of 1900, the streets and brothels of San Francisco, the Napa vineyards—to accentuate the characters’ emotional journeys? How does the author portray the institution of the Catholic Church and its role in Sara and Philippe’s life? Is it a fair portrayal? Which scenes from the novel did you find most memorable? What, if anything, surprised you about the San Francisco Earthquake and Fire of 1906 as it’s described in the book? If you could sit down and chat with one of the characters over a bottle of wine, whom would you choose? Team Philippe or Team Matthew? Now that you’ve finished reading The California Wife, what are your expectations for the next book in the series?